In their marketing materials, ISR providers claim that after 6 months old, "the sooner the safer", that infant swimming lessons save lives, etc. Is there any evidence to suggest that this is true - that teaching infants who are 6-12 months old to back float reduces their risk of fatal drowning? No, there is no scientific evidence and that is explicitly stated by the AAP link you mentioned. The studies referenced by the press release (2010) are preliminary at best and most are methodologically invalid. I'm unaware of any properly designed study. This answer is incomplete, but hopefully contains some relevant and helpful information. Australia: drowning is the leading cause of unintentional injury death in children aged 1-3 years. 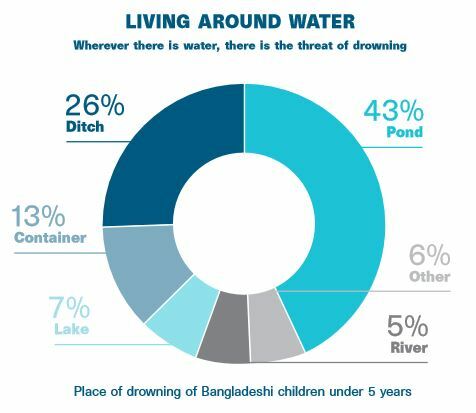 Bangladesh: drowning accounts for 43% of all deaths in children aged 1-4 years. China: drowning is the leading cause of injury death in children aged 1-14 years. 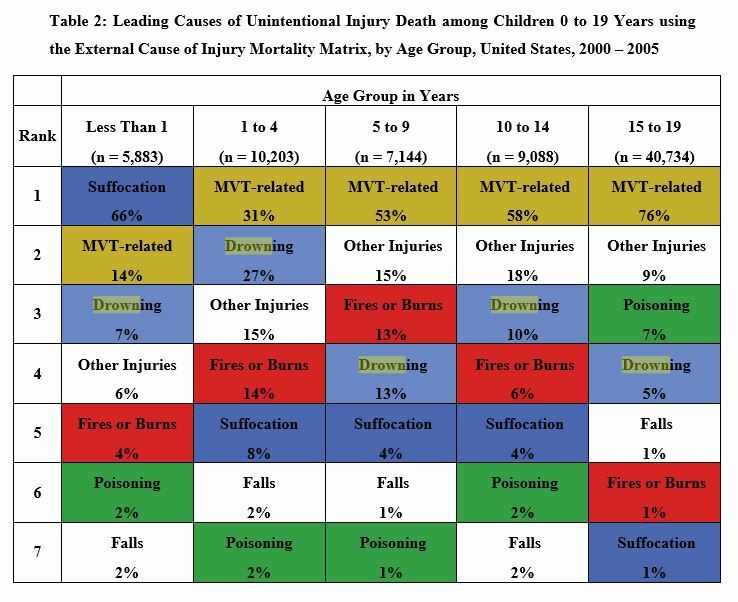 United States: drowning is the second leading cause of unintentional injury death in children aged 1-14 years. We see that percentage wise, the death by drowning rate for infants less than a year old is low. But that seems to be because too many of them suffocate, so let's try to somewhat normalize the data. Number of deaths "n" was 5883, 7% is 412. For the 1-4 year olds, number of deaths was 10203, 27% is 2755. Let's assume the 1,2,3,and 4 year olds are equally likely to drown, which gives us 689 deaths for each year. This seems to be comparable to the 412 for less than 1 year olds, especially considering that less than 1 year olds can't move for the first 5-7 months of their lives. For 1-4 year olds, risk of drowning is significant, compared to other causes of unintentional injury death. For 6-12 month old infants, the risk of drowning seems to be comparable to that of 1-4 year olds. For ages 5 and above, risk of drowning is significantly lower than for ages less than 5. Due to lack of space, backfloating will not save someone from drowning in a bucket or a toilet. Knowing how to backfloat certainly does increase survival chances once inside a pond, bathtub or swimming pool, since not dying in these situations is really all that backfloating is. This answer is incomplete because I do not have any data about the link between the reduced chance of drowning in pools and bathtubs, and the possibly increased exposure to any kind of drowning risk after being taught how to backfloat, and reduced risk awareness of the parents when they know their infant can backfloat. Not the answer you're looking for? Browse other questions tagged safety water children . Does speeding increase the risk of accident? Is 'elimination communication' a common traditional way to 'toilet-train' babies in non-Western countries?